The Old Town Museum is a non-profit corporation goverened by a volunteer Board. It has received an IRS designation as a 501(c)(3) organizations so that donations to the Museum can be considered as tax deductions in accordance with IRS Regulations. This page is intended to provide the reader with information about the history and development of the Old Town Museum and information about the current membership of the Museum’s governing board. The Museum facilities are available for use by local government or local organizations to hold meetings or other events. For more information on the use of the Museum Facilities CLICK HERE. The Old Town Museum, housed in the former St. Mary’s church since 1996. The Old Town Museum was created and dedicated in celebration of the American Bicentennial Year and welcomed the public to its doors on June 26,1976. The museum was originally located in the old waterworks building on the banks of Penobscot River on North Fourth Street Extension. It occupied those quarters for 20 years. 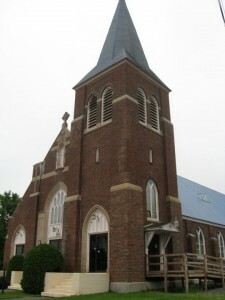 In 1996, it acquired the former St. Mary’s Catholic Church on Main Street in downtown Old Town, Maine. The relocation to this larger, more suitable quarters permitted the Museum to increase its hours of operation and to increase the number and size of the displays. The purpose of the Museum is to create interest in the heritage of Old Town and the surrounding communities. It does this by encouraging the preservation and display of all materials related to the cultural, religious, educational, social, agricultural, and industrial life of the area. The Museum brings together important aspects of the life in Old Town’s past, focusing particularly on the strong roles that lumbering and the wood industry have played in its history. The Mission of the Old Town Museum is to collect, preserve and display objects and information related to the heritage of the Old Town area and its residents; and to create interest in this heritage through programs, exhibits, education and other methods. The Old Town Museum will be the premier source of information on the history and culture of the Old Town area and its people. To view a listing of the current Members of the Old Town Mueum Board of Directors, CLICK HERE. The Old Town Museum’s primary governance document is its Bylaws. To view the current Museum Bylaws, CLICK HERE.